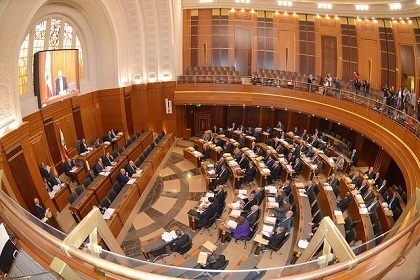 The lebanese parliament failed 9 times in a row to meet and and elect a new Lebanese president but found time to hold a session on Saturday in order to express Lebanon’s solidarity with the Palestinian Gaza Strip and the Iraqi city of Mosul. The session was chaired by parliament Speaker Nabih Berri and attended by Prime Minister Tammam Salam and the majority of political blocs. Yesterday Lebanese Forces MP Antoine Zahra called on MPs to elect a new president on Saturday, after Berri called for a session to express solidarity with Gaza and the Christians of Iraq’s Mosul. “If two thirds of MPs were present to attend tomorrow’s session, then they should be able elect a new president. Refraining from doing so would be a violation of the constitution and an attempt to make people get used to not having a president,” Zahra told Future TV on Friday. Maronite Patriarch Cardinal Beshara Boutros al-Rai blasted last Sunday the MPs for failing to elect a president accusing them of pursuing the interests of foreign countries and their own. Lebanon has had no president since May 25, when Michel Suleiman’s mandate expired, as the two rival blocs that dominate Lebanese politics have been unable to agree on a successor. In today’s session the lawmakers voiced their support to the Palestinian people in Gaza and minorities in Iraq that are being persecuted by the Islamic State of Iraq and the Levant. Free Patriotic Movement chief MP Michel Aoun , who along with Hezbollah have been behind the boycott of the parliament kicked off the session by condemning the developments in Gaza and Iraq. “We question the silence of the Arab world over the crimes against the Christians,” he said. Future Movement bloc chief MP Fouad Siniora remarked that Mosul would not be witnessing such oppression had Iraq had a just state. “A just state protects its people,” he stressed, while saying that the moderate people in the region are victims of extremists. “Dictatorship created extremism. The people’s struggle to escape barrel bombs landed them in the hands of fundamentalists,” he said in reference to the continued use of barrel bombs by the Syrian regime in its attacks against the people. “We have no choice but to adhere to the state in order to shun fundamentalists and militias,” Siniora urged. To that end, he stressed that the Taef Accord that helped Lebanon achieve coexistence between its sects should be adopted in the region. “The accord is the basis of a diverse state,” he said of the agreement that helped end Lebanon’s 1975-90 civil war. “Just states must be established in order to meet the demands of the people and avoid oppressing them, which will only yield extremism,” Siniora continued. “Arab countries must unite to confront extremism,” he said, while lamenting the Arab and international communities’ failure in addressing the Palestinian-Israeli conflict. The conflict is at the heart of the problems in the region, noted Siniora. There are no excuses that justify the persecution of Christians and Muslims, he stated. “We reject all forms of violence and fundamentalism because they violate the core of moderate Islam and ISIL has nothing to do with historic or modern Islam,” added the former PM . “Israel will not succeed in defeating the dignity of the people,” he stressed. “The takfiri threat of ISIL meanwhile wants to fragment the region,” Fayyad said. “All Arabs, regardless of their differences, must unite against Israel and ISIL,” he demanded. Hundreds of Christian families fled their homes in Mosul after the jihadist Islamic State threatened them to convert to Islam, pay a special tax or leave. Well, there’s AOUN WRONG AGAIN. “All minorities in Mosul are being subject to genocide,” he said….. When actually it’s the MAJORITIES who are. In fact millions hit the roads ahead of the ‘Callous-Fat’ herd coming to do the genocide, and there’s still more there than the jerks with the guns. Aoun is NEVER going to get it right. As long as justice is not brought to the people of the Middle East ,the region will be overrun by these dangerous extreme religious militant groups ! !